Four expectant fathers were in a Minnesota hospital waiting room while their wives were in labor. The nurse comes in and tells the first man, "Congratulations, You're the father of twins." "What a coincidence!" the man exclaims. "I work for the Minnesota Twins baseball team!" 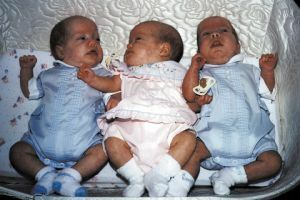 The nurse returns a short while later and tells the second man, "You are the father of triplets." "Wow, what a coincidence!" he replies. "I work for the 3M Corporation." When the nurse comes again, she tells the third man that his wife has given birth to quadruplets. "Another coincidence!" he tells her. "I work for the Four Seasons Hotel!" At this point, the fourth guy faints. When he comes to, the others ask him what was wrong. He moans, "I work for Seven-Eleven!"